Capacity and design: If you have just a foot-wide space under your kitchen counter, this slim 12-inch wide Kalamera 18-bottle wine cooler could be the right built-in choice for you. This compact unit is part of Kalamera’s under-counter series. This means you get the same premium features (e.g. stainless steel, advanced low-noise cooling system, temperature memory function), as the bigger-capacity models in this product line. This Kalamera 18-bottle wine cooler has a compressor-based cooling system. It has stainless steel frame with double-pane glass door. 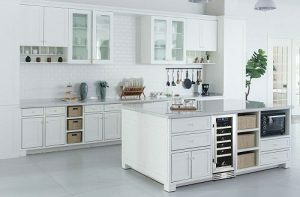 If your kitchen has stainless steel appliances, this unit will continue a seamless flow of shine in your kitchen. Let’s check out its installation configuration. This Kalamera 12-inch model has a modern and elegant exterior – stainless steel frame, front venting, reversible and double-layer tempered glass door. 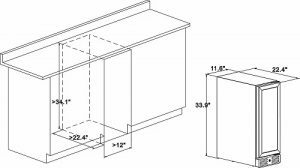 You can install this unit as a built-in, under-counter or freestanding appliance. You can change the door hinge to fit your configuration (to open the door to the left or the right). All Kalamera under-counter units are extremely quiet. You can comfortably carry on a conversation with your guest right next to the cooler – low noise and low vibration. Double-layer tempered glass door. This compact 12-inch wide unit has the same high-quality double-layer tempered glass door, just like the wider 15-inch Kalamera unit. You have already known about UV is not your friend. Having a double pane glass with anti-UV layer – this is a good friend to your wine collection. Wood shelving: This Kalamera 12-inch wide has six beech wooden shelves. These are sliding racks – a good feature to get access to your wine bottles easily. You can store three bottles on each shelf – giving you a total of 18 bottles. Of course, if you are storing larger bottles with diameter bigger than the standard Bordeaux 750ml bottle (such as Champagne), your cooler capacity will be less than 18 bottles. You can also remove a shelf to fit any magnum size (1.5 Liter) bottles. Single temperature zones: This Kalamera 18-bottle wine cooler has a single-zone cooling system. It provides a temperature range: 40°-66°F. This is an excellent cooling range – suitable for either red or white wines. In general, whites are stored between 40°-50°, reds at 55°-65°F. Since this is a single zone, you can only set one temperature for the cooler. If your collection is primarily white, you can still store your red wine in the cooler zone. You will want to take your red wine out of the cooler ten minutes before you serve it – to make it less cold. This 12-inch-wide Kalamera has a simple and an intuitive LCD temperature display with touch controls. 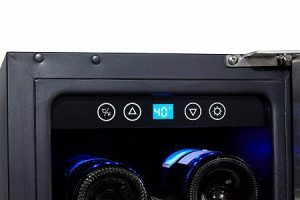 You can easily set the preferred temperature for your wine cooler in seconds. This Kalamera 18-bottle also features a temperature memory function. If you encounter a power outage, this unit will restore the set temperature when the power is back on. LED light: This Kalamera 18-bottle model has an interior blue LED light. You have the option to turn on or off the light via the control panel. So, you have a choice to showcase your wine collection or not. Embedded Carbon Filter: When you open your wine cooler, the air (and therefore aroma) in your kitchen can get inside your wine cooler. The embedded carbon filter helps to protects against odors. Security lock: This Kalamera unit has a built-in universal hexagon-bolt lock in the front. Warranty and support: This Kalamera 30-bottle comes with one-year limited warranty by Kalamera. 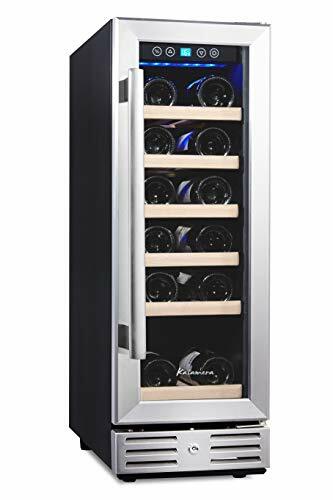 Summary: This Kalamera KRC-18SZB-TGD 12-inch 18-bottle wine cooler (view on Amazon) looks beautiful in any space, as a freestanding, built-in or under-counter in your kitchen. Notable features – stainless steel, double-layer tempered glass, advanced cooling system, temperature memory, and LCD touch control panel. If you are planning to have a small wine collection of 18-bottle to fit into a 12-inch wide space, this unit is an excellent choice.